Trench Journals and Unit Magazines of the First World War is a unique source of information on the common serviceman and woman’s experience of the war. These magazines were written by and for every type of unit from every combatant nation. The database gives you the unique opportunity to access unheard voices of hundreds of thousands of men and women writing from every facet of the conflict. Le Canard des Poilus. June 10, 1916. [23rd Company, 346th Infantry Regiment. French Army]. 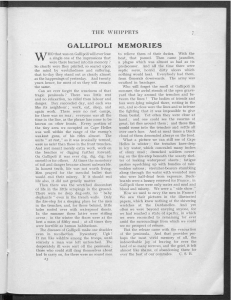 The over 1,500 journals and magazines included were written and illustrated by service personnel from a huge variety of units: the infantry, artillery, air force, naval, supply and transport units, military hospitals and training depots of all combatant nations including America, Britain, Germany, Canada, France, Australia and New Zealand. 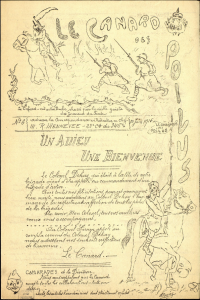 Although the majority of journals that have survived originate from units based on the Western Front in France and Belgium, there are also magazines from units serving on the Eastern Front, in Gallipoli, Palestine, Mesopotamia, Egypt, etc. The Whippets: The Book of the 2nd Lowland Field Ambulance, 1919. Commonly referred to as providing a voice to the unit, they are filled with what mattered most to the unit that created it. As such they served to create a sense of esprit de corps and a means of raising the spirits of the unit through humorous stories, poems, jokes and parodies. They also served to document the unit’s circumstances and experiences and so accounts and memoirs of a more individual history of the war and the unit’s part in it feature prominently in many journals. As a means of offering an outlet for literary or creative expression, the trench journals were hugely important to their contributors. Access available until 28th February 2019. This entry was posted in Library, Online resource, Trial and tagged 20th century, archives, Britain, cultural history, Databases, Europe, First World War, History, magazines, primary source, social history by cstirling. Bookmark the permalink.